However much adults love Christmas, there’s nothing to compare with seeing an excited child on Christmas morning when they see their stocking filled with treats. It’s wonderful to make your own traditions for your family at Christmas – we all love to remember our own childhood Christmases, so you can repeat some things and create your own new Christmas rituals that your children will remember for years to come. You may be a parent or carer to young children, or perhaps a grandparent, looking for ways to make Christmas extra magical for your little people. Here are a few ideas. If you like to have a real Christmas tree - yes, we all know what a mess they make but nothing really compares to a real tree, does it? Why not make the buying of the tree a special part of the run up to Christmas? Rather than leave it until the last minute and then rush around trying to find the least-spindly tree in a state of panic, make an event of it in plenty of time. Talk to your children about the type of tree you want – you could even look up the different types on the internet to learn more – and then go and pick one together, all wrapped up warm. Or you could take a trip out to a forest - the forestry commission has a carefully monitored replanting scheme so you know that for every christmas tree you buy, several more are planted in its place. Many forestry commission sites lay on special Christmas activities, with Santa in his log cabin and Christmas activity trails for the family. You can make this day magical each year with a day out walking in the fresh air, hot chocolate, a visit to Santa and your own Christmas tree to take home. There are two ways to make decorating your Christmas tree extra special. You can either involve your children and do it all together, with Christmas music playing and plenty of time to put on all your favourite decorations, perhaps making a couple of new ones too. Or, you can wait to decorate the tree one evening after your children have gone to bed. 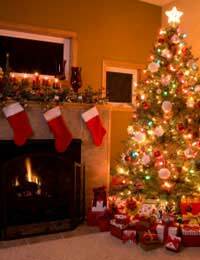 Don’t tell them that you are going to – be careful with all those tell tale signs like getting the box of decorations down from the attic – and then, in the morning, they’ll have that magical moment of seeing the decorated Christmas tree for the first time. It’s a popular tradition in the UK to hang a stocking out on Christmas Eve, so that Father Christmas has somewhere to put the children’s presents. It’s lovely to make a real fuss of this moment as it is one of the most exciting parts of Christmas for a young child – all that expectation of what they might find in their stocking in the morning. What makes it a real event is if you have the same stockings year after year, so unwrapping them ready to hang is part of the delicious anticipation. If you don’t already have a special stocking for each child (and mum and dad!) why not spend a Sunday afternoon before Christmas making one each? You can either buy a basic one from a shop and glue or stitch on an initial, if you’re not particularly handy with crafts, or you could knit one, or cut out a large felt stocking and blanket stitch the edges. Make hanging the stockings special by playing your family’s favourite Christmas music and perhaps cutting the Christmas cake, or having a mince pie. Children also love those chocolate novelties that hang on the Christmas tree. Now that you have your Christmas tree decorated and your stockings ready to be filled with treats, you need to get ready for the visit from Father Christmas. Traditionally, Father Christmas , skilfully driven on his sleigh through the sky by Rudolph and the other reindeer, came down the chimney of each house to deliver Christmas presents early on Christmas morning. If you have a fireplace, this is the perfect focal point for your preparations, with the stockings hung along the mantelpiece. When your little ones have gone to bed, sneakily take a bite out of the pie and the carrot (make the bite marks look different!!) and drink a big sip of the sherry. The, carefully dip one of your Wellington boots (the biggest in the house!) in a little flour (cornflour works best) and leave a footprint or two. When the children come down in the morning, the gleeful shout of ‘Father Christmas has been!” when they see the bulging stockings and signs of his visit will be one of the most wonderful sounds you will ever hear.